Consider the history of the horse. This animal evolved in North America, as early as 55 million years ago. During the Ice Ages, some 2.6 million years ago, they expanded their territory into South America as well as the Old World. The earliest settlers in the Americas may have seen the last survivors of the genus Equus in the Americas before these animals became extinct on the continent, surviving only in the Old World (Asia, Africa and Europe). It was only with the arrival of European settlers that modern horses, now much bigger than their ancestors, were reintroduced into the Americas. 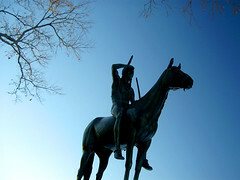 Horse riding culture among American Indians dates back at most a few centuries, not millennia. 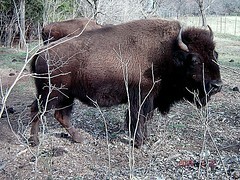 Another iconic image associated with Plains Indian culture is buffalo hunting. Bison hunting (the term buffalo is a misnomer) must have been impressive in its scale and the scope of planning that preceded it. Bison were hunted long before the arrival of European horses. Texas is home to the famous Bonfire kill site, located on the border with Mexico. There, in a small side canyon of the lower Pecos River, hunter-gatherers ran bison over the edge of a cliff several times over a time span of several centuries. These types of hunt were exceptional; they were supplemented by hunting other animals and gathering plant foods. The latter activity probably provided the greatest amount of sustenance to American Indians. Not all Plains tribes hunted bison. Numerous tribes were farmers planting crops, such as corn, introduced from what is now Mexico. 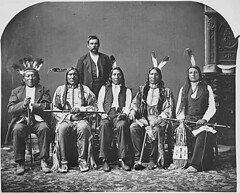 Plains Indian culture is still around today and it is part of a wider American Indian society. Plains Indians can be found on the reservations throughout the United States, or on the bus sitting next to you. Like any other human culture, Plains Indian culture has evolved, while celebrating aspects of its past. Traditional dances became Powwow dances about a century ago and remain very popular. Beadwork, introduced about 150 years ago, also continues to evolve. Could you outwit a monkey Machiavelli? What did Neandertals sound like? As curator of anthropology, Dirk is responsible for the museum’s artifact collection and is involved in its temporary and permanent anthropology exhibits. Dirk is an expert in human cultures; he curates the Museum’s Hall of the Americas and specializes in native American cultures like the Aztec and Maya.